I know...it's not even Christmas yet and I'm wanting to chat about 2018. But the reality is if I wait too long, I will not get ready at all, and before I know it I'll be trying to remember to write 2018 in the middle of March. So it's this point of the year that I feel the need to prepare. To de-clutter physically, mentally and spiritually and prepare my heart and my home for a fresh new start. I love fresh starts, and I love blank pages. They beg for new ideas, fresh thoughts and good news. Leaving old things behind and moving forward into the future path that God has already laid out for us requires us to look backward first to prepare for this future. 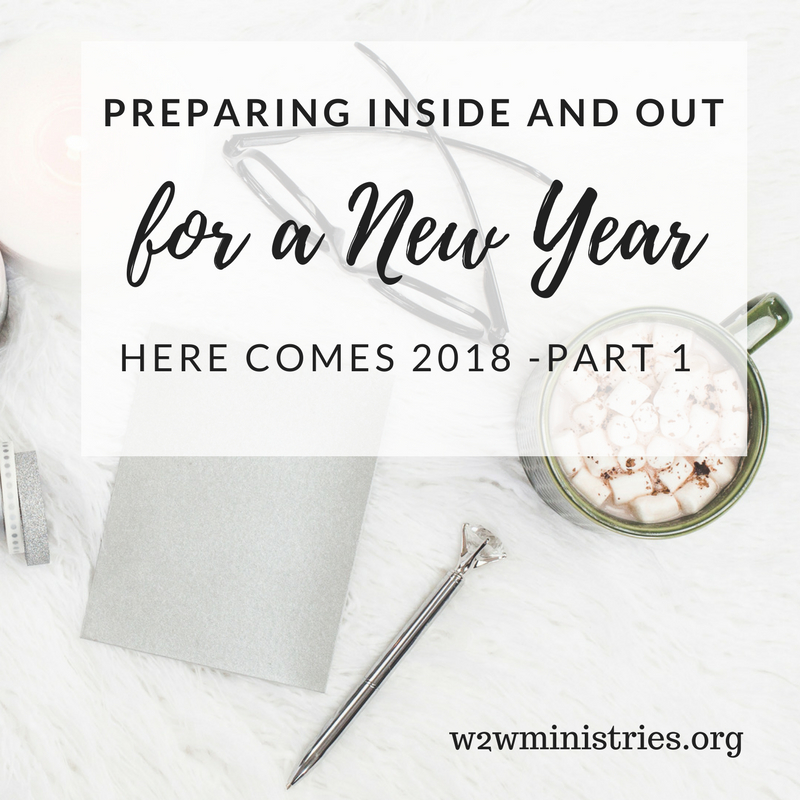 SO how do we prepare inside and out for a brand spanking New Year? First, I think it's important that we spend time each day this month developing a personal consistent daily walk with the Lord. Yes this is an incredibly, crazy busy time - I know, but imagine how much more peace you will have in your life if you are making that relationship a priority in your life now. In 31 days at the start of a New Year you'll be ready with a fresh perspective and important habit already established. There's no better time than the present - make the resolution now - don't wait! This spiritual practice, better yet, discipline is of incredible importance - don't neglect it for the hectic life that awaits you. I challenge you to find a way to start your day focused on your relationship with Christ - it will absolutely change you and breathe fresh new life into your heart and mind, but also prepare you for what Christ has prepared for you for your future in 2018! Make prayer a priority - not only for yourself and your needs but also for others - husband, children, parents, siblings, etc..our marriages, our families and our churches need our vigilant attention in the days ahead. Declutter! I am actively decluttering the things out of my home that we don't need or can't use. In addition as I look at the past year, and set aside time to intentionally develop my relationship with Christ, I am going to seek the Lord's face on the things that are crowding my attention for him. Those things I need to "put off." Or in other words - declutter! 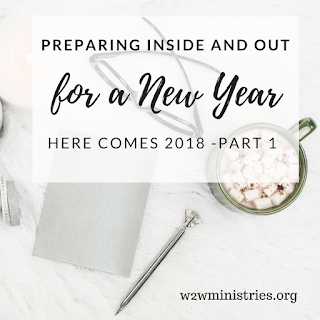 If you'll work hard to prepare your heart Spiritually, the rest will come together and so let's start here friends and prepare ourselves for a mighty awesome 2018! Thanks so much Cherrilynn! that's awesome about Ephesians! Amen! Yes ma'am, prayer is huge. And you're so right. Now is the time to start thinking about goals. Time is shooting by at warp speed, eh? God bless! Love the name of your blog! Absolutely flying by - I'm still catching up! haha! Thanks Rebekah! Thank you for your insight on scheduling for the future. Oh yes. I need to declutter my heart and my office. Thanks you for the reminder. I would LOVE to go into 2018 with a clean slate. I hope you were able to declutter successfully! Thank you for stopping by!